At another Chicago Sustainability Intern lunch, Foundation interns Emily Teerink and Ebony Ellis had the opportunity to learn about Fresh Taste. Fresh Taste formed in 2002 as an initiative by regional foundations that wanted to work together to relocalize the Chicago foodshed and improve equity of access to good food. It works to create efficient channels and predict what is needed next within the food system. Fresh Taste director Karen Lehman, who has spent three decades working on food system issues, provided the overview. Fresh Taste started as a group of five organizations and has since grown its network to more than 10 food-related organizations. By doing so, it has created a learning community. This network creates efficiency so that groups can work better together when addressing issues within the food systems. It is a Mary Poppins organization, as Lehman put it, meaning it comes in and helps, but leaves when its work is done. One issue Fresh Taste works on is food waste. Forty percent of food waste is from consumers and restaurants. In order to reduce waste, Fresh Taste is advocating for a change on food labels. This change would remove the “best if used by” date. Lehman briefly mentioned another Fresh Taste project dealing with community composting. Composting is a way to reduce consumer waste by turning those leftovers and food scraps into a nutrient-rich soil supplement. Food justice is a national food systems issue. Fresh Taste works to address some of these problems in Chicago. In areas often called food deserts, Fresh Taste believes in bringing produce to existing places rather than building new grocery stores. While this works in theory, the larger problem within food desert communities is employment. People are hungry because they do not have money for food. Time, skills, and jobs are the real barriers to healthier foods. With the help of Fresh Taste and partnering organizations, people are able to get double value with their Supplemental Nutrition Assistance Program (SNAP) benefits, commonly called food stamps, at farmer’s markets. Community farming organizations like Growing Power and Windy City Harvest sell at Green City Market for higher prices, which allows to them sell in lower-income neighborhoods at lower prices. 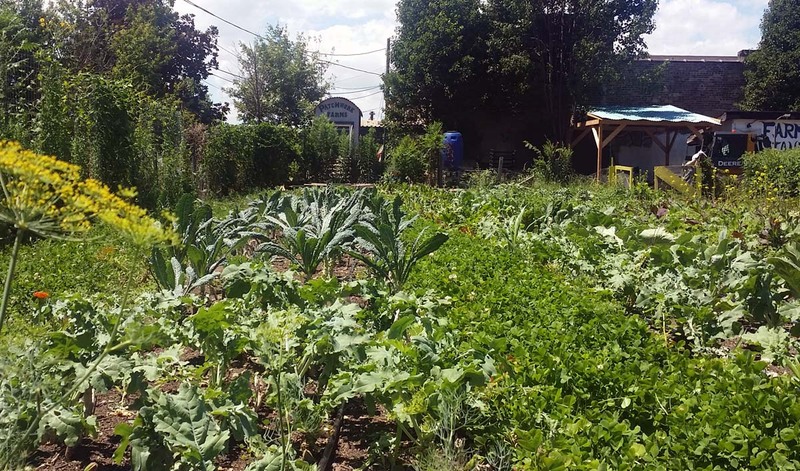 Solving food justice issues is an ongoing process, but with organizations like Fresh Taste, some of the issues are being addressed. Fresh Taste’s list of projects is extensive. Each one seeks to enhance the food system. Currently, Fresh Taste is working on an artisan grain collaboration. This is a regenerative agriculture project that is trying to create a market for goods similar to kernza,® a perennial, long root relative of wheat that is being developed as a dual purpose forage and grain crop in diverse farming operations. This collaboration will not only bring jobs to artisanal bakeries but also lead to more sustainable agricultural practices because kernza does not need to be planted every year. While the Forest Preserve Foundation and Fresh Taste are focused on different environmental issues, the organizations share a passion for sustainability and bettering the communities in which we live and work. We enjoyed listening to Lehman tell her story and learning about an innovative organization working to improve the lives of Chicagoans. Thanks to Karen for making time and to Openlands for hosting the presentation.